Tonsillectomy is a surgical procedure in which both palatine tonsils are fully removed from the back of the throat. The procedure is mainly performed for recurrent throat infections and obstructive sleep apnea (OSA). For those with frequent throat infections, surgery results in fewer sore throats in the following one to two years, but unclear long term benefits. In children with OSA it results in improved quality of life. Typical appearance of the back of the throat three days post tonsillectomy. While generally safe, complications of surgery may include bleeding, vomiting, trouble eating, and trouble talking. Throat pain typically lasts about one to two weeks after surgery. Bleeding occurs in about 1% within the first day and another 2% after that. Death occurs as a result in between 1 in 2,360 and 56,000 procedures. Following the surgery ibuprofen and paracetamol (acetaminophen) may be used to treat postoperative pain. The surgery is often done using metal instruments or electrocautery. The adenoid may also be removed in which case it is known as an "adenotonsillectomy". The surgery has been described since at least as early as 50 AD by Celsus. In the United States, as of 2010, tonsillectomy is performed less frequently than in the 1970s although it remains the second most common outpatient surgical procedure in children. The typical cost when done as an inpatient in the United States is US$4,400 as of 2013. Tonsillectomy is mainly undertaken for sleep apnea and recurrent or chronic tonsillitis. It is also carried out for peritonsillar abscess, periodic fever, aphthous stomatitis, pharyngitis and adenitis (PFAPA), guttate psoriasis, nasal airway obstruction, tonsil cancer and diphtheria carrier state. For children, tonsillectomy is usually combined with the removal of the adenoid. Surgery is not recommended for those with fewer than 7 throat infections in the last year, fewer than 5 each year for the last 2 years, or fewer than 3 each year for 3 years. In children with recurrent tonsilitis the benefit of tonsillectomy is modest with evidence only supporting benefit in the first one to two years. Children who undergo surgery on average have one fewer sore throat per year in the subsequent one or two years, compared to those who do not. Specifically one review found a decrease from 3.6 to 3.0 episodes in the year following surgery. Those with frequent throat infections often improve over a year without surgery. Evidence in adults is unclear. Clinicians may recommend tonsillectomy for recurrent throat infection with a frequency of at least 7 episodes in the past year or at least 5 episodes per year for 2 years or at least 3 episodes per year for 3 years with documentation in the medical record for each episode of sore throat and one or more of the following: temperature >38.3 °C, cervical adenopathy, tonsillar exudates, or positive test for Group A Beta- hemolytic strep. Tonsillectomy improves obstructive sleep apnea (OSA) in most people. A 2015 Cochrane review found moderate quality evidence for benefits in terms of quality of life and symptoms but no benefit in attention or academic performance. It recommended that physicians and parents should weigh the benefits and risks of surgery as OSA symptoms may spontaneously resolve over time. An AHRQ review however did find improvements at school. The procedure is recommended for those who have OSA that has been verified by a sleep study. The evidence for other uses such as tonsil stones, bad breath, trouble swallowing, and an abnormal voice is less strong. While generally safe, tonsillectomy may result in several complications, some of which are serious. Complications of surgery may include vomiting, trouble eating, trouble talking, tongue swelling, damage to structures of the mouth, cardiac arrest and bleeding. Throat pain typically lasts about one to two weeks after surgery. Bleeding after tonsillectomy affects about 4% of children. Bleeding occurs in about 1% within the first day and another 2% after that. Delayed discharge occurs in about 1% of and around 4% of people are readmitted. Death occurs as a result in between 1 in 2,360 and 56,000 procedures. As the procedure is done under general anesthesia, there are anesthesia risks. Tonsillectomy does not appear to affect long term immune function. It does not appear to affect the long term risk of infections in other areas of the body. Some studies have found small changes in immunoglobulin concentrations after tonsillectomy but these are of unclear significance. The association between tonsillectomy and risk for inflammatory bowel disease (e.g., Crohn's disease or ulcerative colitis) is unclear. There is an association suggesting a slight but important increase in the risk of developing multiple sclerosis if done before the age of 20. In 2019, an update of the clinical practice guideline on tonsillectomy in children stated that more research on the immunologic role of the tonsils is needed to make clear under what circumstances surgery does more good than harm. Throat 1 day after a tonsillectomy. Throat some days after a tonsillectomy. For the past 50 years at least, tonsillectomy has been performed by dissecting the tonsil from its surrounding fascia, a so-called total, or extra-capsular tonsillectomy. Problems including pain and bleeding led to a recent resurgence in interest in sub-total tonsillectomy or tonsillotomy, which was popular 60–100 years ago, in an effort to reduce these complications. The generally accepted procedure for 'total' tonsillectomy uses a scalpel and blunt dissection or electrocautery, although harmonic scalpels or lasers have also been used. Bleeding is stopped with electrocautery, ligation by sutures, and the topical use of thrombin, a protein that induces blood clotting. It is not known whether the benefits of subtotal tonsillectomy in obstructive sleep apnea are enduring. But this is also the case for tonsillectomy for sleep apnea. There have been no randomised controlled trials of long term effectiveness of tonsillectomy for sleep apnea. Dissection and snare method: Removal of the tonsils by use of a forceps and scissors with a wire loop called a snare was formerly the most common method practiced by otolaryngologists, but has been largely replaced in favor of other techniques. The procedure requires the patient to undergo general anesthesia; the tonsils are completely removed and the remaining tissue surface is cauterized. The patient will leave with minimal post-operative bleeding. Electrocautery: Electrocautery uses electrical energy to separate the tonsillar tissue and assists in reducing blood loss through cauterization. Research has shown that the heat of electrocautery (400 °C) may result in thermal injury to surrounding tissue. This may result in more discomfort during the postoperative period. Radiofrequency ablation: Monopolar radiofrequency thermal ablation transfers radiofrequency energy to the tonsil tissue through probes inserted in the tonsil. The procedure can be performed in an office (outpatient) setting under light sedation or local anesthesia. After the treatment is performed, scarring occurs within the tonsil causing it to decrease in size over a period of several weeks. The treatment can be performed several times. The advantages of this technique are minimal discomfort, ease of operations, and immediate return to work or school. Tonsillar tissue remains after the procedure but is less prominent. This procedure is recommended for treating enlarged tonsils and not chronic or recurrent tonsillitis. Coblation tonsillectomy: This surgical procedure is performed using plasma to remove the tonsils. Coblation technology combines radiofrequency energy and saline to create a plasma field. The plasma field is able to dissociate molecular bonds of target tissue while remaining relatively cool (40-70 °C), which results in minimal or no damage to surrounding healthy tissue. A Coblation tonsillectomy is carried out in an operating room setting, with the patient under general anesthesia. Tonsillectomies are generally performed for two main reasons: tonsillar hypertrophy (enlarged tonsils) and recurrent tonsillitis. It has been claimed that this technique results in less pain, faster healing, and less post operative care. However, review of 21 studies gives conflicting results about levels of pain, and its comparative safety has yet to be confirmed. This technique has been criticized for a higher than expected rate of bleeding presumably due to the low temperature which may be insufficient to seal the divided blood vessels but several papers offer conflicting (some positive, some negative) results. 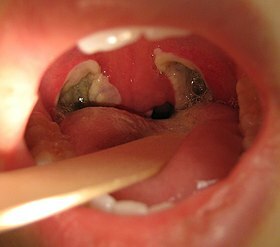 More recent studies of coblation tonsillectomy indicate reduced pain and ostalgia; less intraoperative or postoperative complications; lesser incidence of delayed hemorrhage, more significantly in pediatric populations, less postoperative pain and early return to daily activities, fewer secondary infections of the tonsil bed and significantly lower rates of secondary hemorrhage. Unlike the electrosurgery procedure, Coblation Tonsillectomy generates significantly lower temperatures on contacted tissue. Long term studies seem to show that surgeons experienced with the technique have very few complications. Harmonic scalpel: This medical device uses ultrasonic energy to vibrate its blade at 55kHz. Invisible to the naked eye, the vibration transfers energy to the tissue, providing simultaneous cutting and coagulation. The temperature of the surrounding tissue reaches 80 °C. Proponents of this procedure assert that the end result is precise cutting with minimal thermal damage. Thermal Welding: A new technology which uses pure thermal energy to seal and divide the tissue. The absence of thermal spread means that the temperature of surrounding tissue is only 2-3 °C higher than normal body temperature. Clinical papers show patients with minimal post-operative pain (no requirement for narcotic pain-killers), zero edema (swelling) plus almost no incidence of bleeding. Hospitals in the US are advertising this procedure as "Painless Tonsillectomy". Also known as Tissue Welding. Carbon dioxide laser: When a laser is used to perform tonsillectomy, it can be under local anaesthetic with anaesthetic spray only, called tonsillotomy (or tonsil resurfacing), or it can be performed under general anaesthetic when it is called intra-capsular tonsillectomy, using an operating microscope for magnification. The carbon dioxide laser in scanning mode is an excellent vapouriser of tissue, and in conjunction with a computerised pattern generator and operating microscope with micromanipulator, it can result in near total removal of tonsil tissue whilst preserving the capsule of the tonsil. This leads to a significantly reduced bleeding and pain rate. The local anaesthetic technique takes around 10 minutes, the general around 20 minutes depending on the size of the tonsils - the bigger they are, the longer it takes. The general anaesthetic operation has a revision rate of 1:50, the local anaesthetic tonsillotomy 1:4.5. This is different from procedures where a laser is used to reduce or resurface the tonsils (e.g. laser cryptolysis). Providing the absence of certain contra-indications such as sensitive gag reflex, LAST can be performed under local anesthetic as an outpatient procedure. A carbon dioxide laser is commonly used, and is swept over each tonsil 8–10 times. The smoke is aspirated out of the mouth to prevent smoke inhalation. Often, more than one procedure is required, each lasting about 20 minutes. Due to the frequent requirement for multiple sessions, this treatment may work out more expensive than a single session tonsillectomy. A degree of patient compliance is required, making it unsuitable for young children and anxious persons, who risk harm if they move during the procedure. Microdebrider: The microdebrider is a powered rotary shaving device with continuous suction often used during sinus surgery. It is made up of a cannula or tube, connected to a hand piece, which in turn is connected to a motor with foot control and a suction device. The endoscopic microdebrider is used in performing a partial tonsillectomy, by partially shaving the tonsils. This procedure entails eliminating the obstructive portion of the tonsil while preserving the tonsillar capsule. A natural biologic dressing is left in place over the pharyngeal muscles, preventing injury, inflammation, and infection. The procedure results in less post-operative pain, a more rapid recovery, and perhaps fewer delayed complications. However, the partial tonsillectomy is suggested for enlarged tonsils—not those that incur repeated infections. A single dose of the corticosteroid drug dexamethasone may be given during surgery to prevent post-operative vomiting. A dose of dexamethasone during surgery prevents vomiting in one out of every five children. Children also return to a normal diet more quickly and have less post-operative pain. A sore throat will persist approximately two weeks following surgery while pain following the procedure is significant and may necessitate a hospital stay. Recovery can take from 7 to 10 days and proper hydration is very important during this time, since dehydration can increase throat pain, leading to a circle of poor fluid intake. Tonsillectomy appears to be more painful in adults than children. At some point, most commonly 7–11 days after the surgery (but occasionally as long as two weeks (14 days) after), bleeding can occur when scabs begin sloughing off from the surgical sites. The overall risk of bleeding is approximately 1–2%. It is higher in adults, especially males over age 70 and three quarters of bleeding incidents occur on the same day as the surgery. Approximately 3% of adults develop bleeding at this time which may sometimes require surgical intervention. Recommendations for pain management include ibuprofen and paracetamol (acetaminophen). The opioid codeine is not recommended for those less than 12 years old. There is a theoretical concern that NSAIDs may increase the risk of bleeding but evidence does not support such a risk. There are significant variations in tonsillectomy rates, both between and within countries. As it is unlikely that recurrent sore throats vary in frequency between countries it suggests that many tonsillectomies may in fact be done without sufficient medical justification.The Dartmouth Atlas of Health Care.</ref> In 2015, tonsillectomy rates in the Netherlands, Belgium, Finland and Norway were at least twice those in the UK but rates in Spain, Italy and Poland were at least a quarter lower. Childhood tonsillectomy rates in the USA are among the highest in the world and are three times higher than in England. Tonsillectomy rates vary considerably between even quite similar countries: rates are three times higher in Croatia than Slovenia. A 2010 study in England found the annual tonsillectomy rate per 100,000 between 2000 and 2005 was 754 in the highest region, the national average was 304 and the lowest region was 102. This means there is a seven-fold difference between the region with the highest tonsillectomy rate and the region with the lowest one. In 2006, Chief Medical Officer Liam Donaldson revealed that unnecessary tonsillectomies and unnecessary hysterectomies combined cost the British National Health Service 21 million Pounds a year. In 2018, a study of the medical records of 1,630,807 UK children found 15,760 had sufficient sore throats to justify tonsillectomy, but only 13.6% (2144) underwent surgery. This means that even in children who experience frequent, severe sore throats, the vast majority do not undergo tonsillectomy, suggesting it is not essential even in severely affected children. The same study found 18,281 children who had undergone tonsillectomy, but of these only 11.7% (2144) had evidence-based indications (i.e. frequent enough sore throats to justify surgery). This did not change over 12 years from 2005 to 2016. The vast majority of tonsillectomies were undertaken for indications which did not have an evidence-base: five to six sore throats in one year (12.4%), two to four sore throats in one year (44.6%), sleep disordered breathing (12.3%), or obstructive sleep apnoea (3.9%). In the UK therefore, most children who undergo tonsillectomy probably do not benefit and most children who might benefit do not undergo tonsillectomy. The study says that 32,500 out of the 37,000 children who have their tonsils removed annually "are unlikely to benefit". No similar study has been undertaken in any other country. Therefore, it is not known if the situation is better or worse elsewhere. However tonsillectomy rates are lower in the UK than in many countries including the USA, the Netherlands and Germany. Table: Numbers of children (from 1.6 million children between 2005 and 2016 in the UK) identified with possible indications for tonsillectomy and the numbers who subsequently undergo tonsillectomy. It is a well known fact that, in general, surgeons who are paid fee-for-service reimbursements, are more inclined to perform surgery and therefore perform unnecessary surgery more often than surgeons who are paid a fixed salary. For example, in 1968 a Canadian study pointed out that ENT specialists working on a fee-for-service programme were twice as likely to perform a tonsillectomy than those who were not. Tonsillectomy can be considered as an industry with a market. In the USA there are 530,000 childhood tonsillectomies annually. At an average of $3500 per operation this is an industry worth $1.855 billion yearly. The rise in adenotonsillectomies for sleep apnoea in the USA has been much greater than the decline in tonsillectomies for sore throat. This means that the tonsillectomy industry continues to grow, despite limited evidence that tonsillectomy confers significant benefits and increasing concerns in relation to long term safety. In 2009 US President Obama even remarked: "Right now, doctors, a lot of times, are forced to make decisions based on the fee payment schedule that's out there. So if they're looking and -- and you come in and you've got a bad sore throat, or your child has a bad sore throat, or has repeated sore throats, the doctor may look at the reimbursement system and say to himself, 'You know what? I make a lot more money if I take this kid's tonsils out.' Now, that may be the right thing to do. But I'd rather have that doctor making those decisions just based on whether you really need your kid's tonsils out or whether it might make more sense just to change -- maybe they have allergies. Maybe they have something else that would make a difference." According to numerous studies and anecdotal evidence, parental pressure has played a significant role in the decisions of general practitioners and ENT specialists regarding (referral for) tonsillectomy over the past decades. For example, in 1948 a British aurist wrote in a letter to the British Medical Journal "(...) it would be disastrous to leave the decision to the parents. Anybody with experience in school tonsil clinics knows that parents who bring their children very often say: I want my child's tonsils removed and are more than displeased when told that tonsillectomy is not advised." Six years later, in 1954, British family doctor Oliver Plowright said something similar: "One of the difficulties we doctors are up against is that in assessing the effects on the child both of the affected tonsils and of their removal, we are considerably dependent on the opinion of the parents. Quite unjustifiably, the operation for removal of the tonsils has achieved a tremendous reputation among parents who will badger us until, in desperation, we are forced to agree that perhaps they had better come out after all." In 1957 an English general practitioner who was very sceptical towards tonsillectomy, reported that of the 40 children of his practice who had their tonsils removed, 6 (15%) had the procedure done because of "parental pressure that could not be resisted". Four years later, in 1961, English paediatrician Ronald Illingworth commented "The operation should never be performed because the parents want it, the doctor wants it, or a school nurse, aunt or grandmother wants it. The child alone is the one who matters." In the same year, an English ENT specialist remarked "It is difficult to persuade parents and practitioners that the tonsil has other functions than just to be taken out when large.". In 2003, British otolaryngologist Martin Burton concluded: "Armed with an understanding of the natural history of recurrent tonsillitis, details of the management options available and information about the nature and risks of surgery, the appropriately counselled parents can make a decision with and on behalf of their own child. Many of them elect for surgery. But we should not delude ourselves that this decision is made on the basis of anything they have been told during the counselling process. I suspect that in many cases the decision has been made before the consultation with the specialist, perhaps even before the consultation with the general practitioner. In many quarters the word on the street is still this—if you’re having trouble with your throat, you should have your tonsils out. Fashions may change capriciously; tenets in popular culture are harder to dispel.". Parental pressure has also been reported in Canada. In 1972, Canadian ENT specialist Dr. Simon McGrail wrote: "As size is perhaps the commonest indication for surgery so far as the child's parents are concerned, the physician must be firm in resisting what may be very strong pressure from an anxious mother or father. Size is rarely an indication in itself for removal." and "The T and A operation has no apparent place in (...) particularly parental pressures with such indications as a brother or sister already booked on a certain day, or because Johnny is now seven years old.". In 1974, two Canadian researchers recommended: "The time has come when we should weigh the practice against the results. Too often physicians scheduled [adenotonsillectomies] out of habit or in response to parental pressure.". Three years later, Canadian family physician Nancy Naylor remarked "Parents often ask: Doctor, his tonsils are so large! Don't you think he should have them out?". Compared to other countries, tonsillectomy rates have always been high in the Netherlands and remain one of the highest in the world, which according to Dutch ENT specialist Anne Schilder is because of cultural reasons. In 1964 a Dutch ENT specialist commented that once a child has benefited from the procedure, its parents often urge to have the procedure done on their other children, even without any medical indication, and that doctors should strongly resist that urge. According to a document written in 2008 by the umbrella organization of ten health insurers in The Netherlands, many unnecessary tonsillectomies are still performed because of parental demand. In 1995 an Israeli ENT surgeon reported that of the 90 the children he examined, 17 times (19%) the mother was "enthusiastic for surgery". In 2012, a US paediatric intensive care physician wrote in his blog "I've met dozens of parents who say their child (or themselves as children) had constant strep infections until the tonsils came out. Often these same parents (and especially their grandparents) had had their tonsils out as children and more or less regarded tonsillectomy as something children need, like vaccinations.". Tonsillectomies have been practiced for over 2,000 years, with varying popularity over the centuries. The procedure is claimed in some books as "Hindu medicine" about 1000 BCE (non-evidence based literature). Others refer to it as cleaning of tonsil using the nail of the index finger. Roughly a millennium later the Roman aristocrat Aulus Cornelius Celsus (25 BCE – 50 CE) described a procedure whereby using the finger (or a blunt hook if necessary), the tonsil was separated from the neighboring tissue before being cut out. Galen (121–200 CE) was the first to advocate the use of the surgical instrument known as the snare, a practice that was to become common until Aetius (490 CE) recommended partial removal of the tonsil, writing "Those who extirpate the entire tonsil remove, at the same time, structures that are perfectly healthy, and, in this way, give rise to serious Hæmorrhage". In the 7th century Paulus Aegineta (625–690) described a detailed procedure for tonsillectomy, including dealing with the inevitable post-operative bleeding. 1,200 years pass before the procedure is described again with such precision and detail. The Middle Ages saw tonsillectomy fall into disfavor; Ambroise Pare (1509) wrote it to be "a bad operation" and suggested a procedure that involved gradual strangulation with a ligature. This method was not popular with the patients due to the immense pain it caused and the infection that usually followed. Scottish physician Peter Lowe in 1600 summarized the three methods in use at the time, including the snare, the ligature, and the excision. At the time, the function of the tonsils was thought to be absorption of secretions from the nose; it was assumed that removal of large amounts of tonsillar tissue would interfere with the ability to remove these secretions, causing them to accumulate in the larynx, resulting in hoarseness. For this reason, physicians like Dionis (1672) and Lorenz Heister censured the procedure. In 1828, physician Philip Syng Physick modified an existing instrument originally designed by Benjamin Bell for removing the uvula; the instrument, known as the tonsil guillotine (and later as a tonsillotome), became the standard instrument for tonsil removal for over 80 years. By 1897, it became more common to perform complete rather than partial removal of the tonsil after American physician Ballenger noted that partial removal failed to completely alleviate symptoms in a majority of cases. His results using a technique involving removal of the tonsil with a scalpel and forceps were much better than partial removal; tonsillectomy using the guillotine eventually fell out of favor in America. During the 1940s and 1950s, several studies found an association between tonsillectomy and poliomyelitis with recommendations not to do the operation during outbreaks. ^ a b c d e f g h i j k l m n o p q r s t u v w x y z aa ab ac ad ae Mitchell, Ron B.; Archer, Sanford M.; Ishman, Stacey L.; Rosenfeld, Richard M.; Coles, Sarah; Finestone, Sandra A.; Friedman, Norman R.; Giordano, Terri; Hildrew, Douglas M.; Kim, Tae W.; Lloyd, Robin M.; Parikh, Sanjay R.; Shulman, Stanford T.; Walner, David L.; Walsh, Sandra A.; Nnacheta, Lorraine C. (5 February 2019). "Clinical Practice Guideline: Tonsillectomy in Children (Update)". Otolaryngology–Head and Neck Surgery. 160 (1_suppl): S1–S42. doi:10.1177/0194599818801757. PMID 30798778. ^ a b c d e f g h Burton MJ, Glasziou PP, Chong LY, Venekamp RP (November 2014). "Tonsillectomy or adenotonsillectomy versus non-surgical treatment for chronic/recurrent acute tonsillitis". The Cochrane Database of Systematic Reviews (11): CD001802. doi:10.1002/14651858.CD001802.pub3. PMC 5804872. PMID 25407135. Adeno-/tonsillectomy leads to a reduction in the number of episodes of sore throat and days with sore throat in children in the first year after surgery compared to (initial) non-surgical treatment. ^ a b c d Venekamp RP, Hearne BJ, Chandrasekharan D, Blackshaw H, Lim J, Schilder AG (October 2015). "Tonsillectomy or adenotonsillectomy versus non-surgical management for obstructive sleep-disordered breathing in children". The Cochrane Database of Systematic Reviews (10): CD011165. doi:10.1002/14651858.CD011165.pub2. PMID 26465274. ^ Flint, Paul W.; Haughey, Bruce H.; Robbins, K. Thomas; Thomas, J. Regan; Niparko, John K.; Lund, Valerie J.; Lesperance, Marci M. (2014). Cummings Otolaryngology - Head and Neck Surgery E-Book. Elsevier Health Sciences. p. 2862. ISBN 9780323278201. ^ a b Damiani, F; Rada, G; Gana, JC; Brockmann, PE; Alberti, G (2 September 2016). "Long-term effects of adenotonsillectomy in children with obstructive sleep apnoea: protocol for a systematic review". BMJ Open. 6 (9): e010030. doi:10.1136/bmjopen-2015-010030. PMC 5020755. PMID 27591015. ^ Lamprell, L; Ahluwalia, S (April 2015). "Who has been hiding in your tonsillectomy tray? Eponymous instruments in tonsillectomy surgery". The Journal of Laryngology and Otology. 129 (4): 307–13. doi:10.1017/S0022215114003016. PMID 25658777. ^ Sun, GH; Auger, KA; Aliu, O; Patrick, SW; DeMonner, S; Davis, MM (December 2013). "Variation in inpatient tonsillectomy costs within and between US hospitals attributable to postoperative complications". Medical Care. 51 (12): 1048–54. doi:10.1097/MLR.0b013e3182a50325. PMID 23969585. ^ Morad A, Sathe NA, Francis DO, McPheeters ML, Chinnadurai S (February 2017). "Tonsillectomy Versus Watchful Waiting for Recurrent Throat Infection: A Systematic Review". Pediatrics. 139 (2): e20163490. doi:10.1542/peds.2016-3490. PMC 5260157. PMID 28096515. ^ "Clinical Indicators Tonsillectomy, Adenoidectomy, Adenotonillectomy, Clinical Indicators Compendium". American Academy of Otolaryngology – Head and Neck Surgery. 2012. Archived from the original on 2 November 2009. ^ Francis DO, Fonnesbeck C, Sathe N, McPheeters M, Krishnaswami S, Chinnadurai S (March 2017). "Postoperative Bleeding and Associated Utilization following Tonsillectomy in Children". Otolaryngology–Head and Neck Surgery. 156 (3): 442–455. doi:10.1177/0194599816683915. PMC 5639328. PMID 28094660. ^ Bitar, MA; Dowli, A; Mourad, M (August 2015). "The effect of tonsillectomy on the immune system: A systematic review and meta-analysis". International Journal of Pediatric Otorhinolaryngology. 79 (8): 1184–91. doi:10.1016/j.ijporl.2015.05.016. PMID 26055199. ^ Ingram, DG; Friedman, NR (December 2015). "Toward Adenotonsillectomy in Children: A Review for the General Pediatrician". JAMA Pediatrics. 169 (12): 1155–61. doi:10.1001/jamapediatrics.2015.2016. PMID 26436644. ^ Xiong, HF; Wang, B; Zhao, ZH; Hong, J; Zhu, Y; Zhou, X; Xie, Y (May 2016). "Tonsillectomy and inflammatory bowel disease: a meta-analysis". Colorectal Disease (Review). 18 (5): O145–53. doi:10.1111/codi.13323. PMID 26946482. ^ Sun W, Han X, Wu S, Yang C (June 2016). "Tonsillectomy and the risk of inflammatory bowel disease: A systematic review and meta-analysis". Journal of Gastroenterology and Hepatology. 31 (6): 1085–94. doi:10.1111/jgh.13273. PMID 26678358. ^ Bonovas, Stefanos; Lytras, Theodore; Nikolopoulos, Georgios K.; Peyrin-Biroulet, Laurent; Danese, Silvio; Piovani, Daniele (20 April 2019). "Environmental Risk Factors for Inflammatory Bowel Diseases: an Umbrella Review of Meta-analyses". Gastroenterology. 0 (0). doi:10.1053/j.gastro.2019.04.016. ISSN 0016-5085. ^ Lunny C, Knopp-Sihota JA, Fraser SN (May 2013). "Surgery and risk for multiple sclerosis: a systematic review and meta-analysis of case-control studies". BMC Neurology. 13: 41. doi:10.1186/1471-2377-13-41. PMC 3651719. PMID 23648120. ^ Belbasis, L; Bellou, V; Evangelou, E; Ioannidis, JP; Tzoulaki, I (March 2015). "Environmental risk factors and multiple sclerosis: an umbrella review of systematic reviews and meta-analyses". The Lancet. Neurology. 14 (3): 263–73. doi:10.1016/S1474-4422(14)70267-4. PMID 25662901. ^ Walton J, Ebner Y, Stewart MG, April MM (March 2012). "Systematic review of randomized controlled trials comparing intracapsular tonsillectomy with total tonsillectomy in a pediatric population". Archives of Otolaryngology–Head & Neck Surgery. 138 (3): 243–9. doi:10.1001/archoto.2012.16. PMID 22431869. ^ "COBLATION Plasma Technology - ENT". Smith & Nephew US Professional. Retrieved 15 July 2016. ^ Friedman M, LoSavio P, Ibrahim H, Ramakrishnan V (May 2003). "Radiofrequency tonsil reduction: safety, morbidity, and efficacy". The Laryngoscope. 113 (5): 882–7. doi:10.1097/00005537-200305000-00020. PMID 12792327. ^ Windfuhr JP (May 2007). "[Coblation tonsillectomy: a review of the literature]". Hno. 55 (5): 337–48. doi:10.1007/s00106-006-1523-3. PMID 17431570. ^ Hong SM, Cho JG, Chae SW, Lee HM, Woo JS (June 2013). "Coblation vs. Electrocautery Tonsillectomy: A Prospective Randomized Study Comparing Clinical Outcomes in Adolescents and Adults". Clinical and Experimental Otorhinolaryngology. 6 (2): 90–3. doi:10.3342/ceo.2013.6.2.90. PMC 3687068. PMID 23799166. ^ Omrani M, Barati B, Omidifar N, Okhovvat AR, Hashemi SA (January 2012). "Coblation versus traditional tonsillectomy: A double blind randomized controlled trial". Journal of Research in Medical Sciences. 17 (1): 45–50. PMC 3523437. PMID 23248656. ^ Walner DL, Miller SP, Villines D, Bussell GS (October 2012). "Coblation tonsillectomy in children: incidence of bleeding". The Laryngoscope. 122 (10): 2330–6. doi:10.1002/lary.23526. PMID 22833366. ^ Khan I, Abelardo E, Scott NW, Shakeel M, Menakaya O, Jaramillo M, Mahmood K (February 2012). "Coblation tonsillectomy: is it inherently bloody?". European Archives of Oto-Rhino-Laryngology. 269 (2): 579–83. doi:10.1007/s00405-011-1609-8. PMID 21547390. ^ Mösges R, Hellmich M, Allekotte S, Albrecht K, Böhm M (June 2011). "Hemorrhage rate after coblation tonsillectomy: a meta-analysis of published trials". European Archives of Oto-Rhino-Laryngology. 268 (6): 807–16. doi:10.1007/s00405-011-1535-9. PMC 3087106. PMID 21373898. ^ Belloso A, Chidambaram A, Morar P, Timms MS (November 2003). "Coblation tonsillectomy versus dissection tonsillectomy: postoperative hemorrhage". The Laryngoscope. 113 (11): 2010–3. doi:10.1097/00005537-200311000-00029. PMID 14603065. ^ "COBLATION Tonsillectomy - My Tonsils". My Tonsils.com. Retrieved 11 July 2016. ^ Randive S, Stevens B, Dilkes M, Mehta V (2012). "Regional Anaesthesia and Acute Pain, Paper No: 852.00: Do laser tonsillectomies need less opioids as compared to standard tonsillectomies: a retrospective comparison of peri-operative analgesic requirement". British Journal of Anaesthesia. 108: ii387–ii437. doi:10.1093/bja/aer489. ^ "Interventional procedure overview of laser assisted serial tonsillectomy" (PDF). National institute of clinical excellence. Archived from the original (PDF) on 4 December 2013. Retrieved 30 November 2013. ^ a b c Steward DL, Grisel J, Meinzen-Derr J (August 2011). Steward DL (ed.). "Steroids for improving recovery following tonsillectomy in children". The Cochrane Database of Systematic Reviews (8): CD003997. doi:10.1002/14651858.CD003997.pub2. PMID 21833946. ^ Graham JM, Scadding GK, Bull PD (2008). Pediatric ENT. Springer. p. 136. ISBN 978-3-540-69930-9. ^ Timby BK, Nancy Ellen Smith (2006). Introductory medical-surgical nursing. Lippincott Williams & Wilkins. p. 357. ISBN 978-0-7817-8032-2. ^ Graumüller S, Laudien B (2003). "Postoperative pain after tonsillectomy—comparison of children and adults". International Congress Series. 1254: 469–472. doi:10.1016/S0531-5131(03)01073-2. ^ Windfuhr JP, Chen YS, Remmert S (February 2005). "Hemorrhage following tonsillectomy and adenoidectomy in 15,218 patients". Otolaryngology–Head and Neck Surgery. 132 (2): 281–6. doi:10.1016/j.otohns.2004.09.007. PMID 15692542. ^ Lewis, SR; Nicholson, A; Cardwell, ME; Siviter, G; Smith, AF (18 July 2013). "Nonsteroidal anti-inflammatory drugs and perioperative bleeding in paediatric tonsillectomy". The Cochrane Database of Systematic Reviews (7): CD003591. doi:10.1002/14651858.CD003591.pub3. PMID 23881651. ^ a b c d "Surgical operations and procedures statistics". EuroStat. European Union. ^ a b c Baugh RF, Archer SM, Mitchell RB, Rosenfeld RM, Amin R, Burns JJ, Darrow DH, Giordano T, Litman RS, Li KK, Mannix ME, Schwartz RH, Setzen G, Wald ER, Wall E, Sandberg G, Patel MM (January 2011). "Clinical practice guideline: tonsillectomy in children". Otolaryngology–Head and Neck Surgery. 144 (1 Suppl): S1–30. doi:10.1177/0194599810389949. PMID 21493257. ^ Suleman M, Clark MP, Goldacre M, Burton M (April 2010). "Exploring the variation in paediatric tonsillectomy rates between English regions: a 5-year NHS and independent sector data analysis". Clinical Otolaryngology. 35 (2): 111–7. doi:10.1111/j.1749-4486.2010.02086.x. PMID 20500580. ^ "Billions of NHS money wasted on 'ineffective' operations". Evening Standard. Retrieved 27 January 2018. ^ a b Šumilo D, Nichols L, Ryan R, Marshall T (January 2019). "Incidence of indications for tonsillectomy and frequency of evidence-based surgery: a 12-year retrospective cohort study of primary care electronic records". The British Journal of General Practice. 69 (678): e33–e41. doi:10.3399/bjgp18X699833. PMC 6301361. PMID 30397014. ^ Shafrin J (May 2010). "Operating on commission: analyzing how physician financial incentives affect surgery rates". Health Economics. 19 (5): 562–80. doi:10.1002/hec.1495. PMID 19399752. ^ Brownlee S (2007). Overtreated. ^ Hastings JE, Mott FD, Hewitt D, Barclay A (July 1970). "An interim report on the Sault Ste. Marie study: a comparison of personal health services utilization. A joint Canada-World Health Organization Project". Canadian Journal of Public Health. 61 (4): 289–96. PMID 5451974. ^ Vanvuren C (25 August 2017). "How much does a tonsillectomy cost?". Amnino. Retrieved 29 November 2018. ^ Bhattacharyya N, Lin HW (November 2010). "Changes and consistencies in the epidemiology of pediatric adenotonsillar surgery, 1996-2006". Otolaryngology–Head and Neck Surgery. 143 (5): 680–4. doi:10.1016/j.otohns.2010.06.918. PMID 20974339. ^ "Obama's Fifth News Conference". The New York Times. 22 July 2009. ISSN 0362-4331. Retrieved 5 January 2019. ^ a b c Mckee WJ (May 1961). "An interim report on a tonsillectomy survey". Proceedings of the Royal Society of Medicine. 54 (5): 399–402. PMC 1869538. PMID 13774023. ^ Bolande RP (March 1969). "Ritualistic surgery--circumcision and tonsillectomy". The New England Journal of Medicine. 280 (11): 591–6. doi:10.1056/NEJM196903132801105. PMID 4885060. ^ Furman RA (February 1959). "Handling parental pressure for T and A". The Journal of Pediatrics. 54 (2): 195–9. doi:10.1016/S0022-3476(59)80062-7. PMID 13621366. ^ Burton MJ (February 2008). "Commentary: Tonsillectomy--then and now". International Journal of Epidemiology. 37 (1): 23–5. doi:10.1093/ije/dym259. PMID 18184674. ^ Berger R (September 1976). "The question of tonsillectomy and adenoidectomy: still with us in 1976". The Journal of the American Osteopathic Association. 76 (1): 32–4. PMID 1048964. ^ a b Shah CP, Carr LM (February 1974). "Tonsillectomies: in dollars and cents". Canadian Medical Association Journal. 110 (3): 301 passim. PMC 1947283. PMID 4204596. ^ Miller A (4 September 1948). "Use and Abuse of Tonsillectomy". British Medical Journal. 2 (4574): 498. doi:10.1136/bmj.2.4574.498-c. PMC 2091910. ^ Plowright O (November 1954). "Discussion on tonsils and adenoids". Proceedings of the Royal Society of Medicine. 47 (11): 955–7. PMC 1918994. PMID 13215539. ^ Fry J (January 1957). "Are all "T's and A's" really necessary?". British Medical Journal. 1 (5011): 124–9. doi:10.1136/bmj.1.5011.124. PMC 1974118. PMID 13383209. ^ Burton M (February 2003). "Tonsillectomy". Archives of Disease in Childhood. 88 (2): 95–6. doi:10.1136/adc.88.2.95. PMC 1719452. PMID 12538300. ^ McGrail, J. Simon (January 1972). "Tonsillectomy and Adenoidectomy — To Do or Not to Do?". Canadian Family Physician. 18 (1): 53–54. ISSN 0008-350X. PMC 2370344. PMID 20468720. ^ Naylor NL (September 1977). "Tonsillectomy and adenoidectomy: a review of the literature". Canadian Family Physician. 23: 113–7. PMC 2378727. PMID 21304842. ^ "Cultuuromslag bij besluit knippen amandelen". NU. 7 September 2011. Retrieved 9 January 2019. ^ "Voor of tegen tonsillectomie". Nederlands Tijdschrift voor Geneeskunde (in Dutch). 2 December 2009. Retrieved 9 January 2019. ^ Bits, Annetta (2 October 2008). Dbc-inkoopgids 2009: Kwaliteit Als Kompas Bij De Inkoop Van Zorg (in Dutch). Bohn Stafleu van Loghum. ISBN 9789031360925. ^ Fried D (September 1995). "On tonsillectomy: mom's personal experience". Lancet. 346 (8976): 714. doi:10.1016/S0140-6736(95)92333-0. PMID 7658864. ^ Johnson C (19 November 2012). "Where are the tonsils and why would we take them out?". KevinMD.com. Retrieved 21 December 2018. ^ a b c d e f g McNeill RA (June 1960). "A History of Tonsillectomy: Two Millenia of Trauma, Haemorrhage and Controversy". The Ulster Medical Journal. 29 (1): 59–63. PMC 2384338. PMID 20476427. ^ Mawdsley, Stephen E. (26 July 2014). "Polio provocation: solving a mystery with the help of history". The Lancet. 384 (9940): 300–301. doi:10.1016/S0140-6736(14)61251-4. ISSN 0140-6736. "Clinical UM Guideline CG-SURG-30: Tonsillectomy for Children". Blue Cross Blue Shield Association of Georgia.